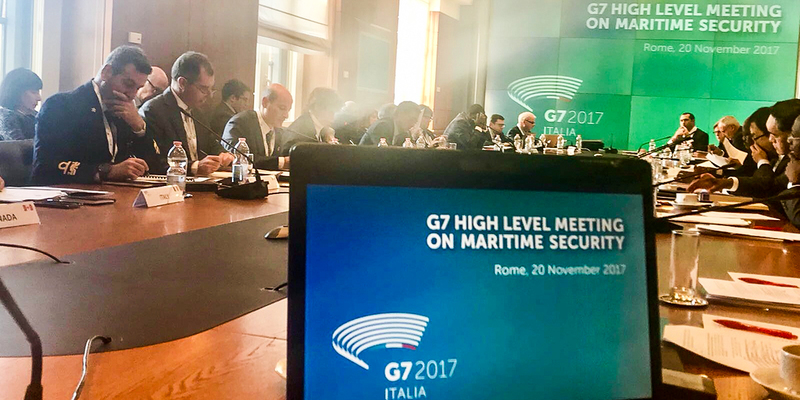 Traditional threats to maritime security, technological innovations and the challenges posed by marine environmental degradation to international stability have been at the core of the G7 High Level Meeting on Maritime Security, which took place on November 20, 2017 at the Italian Ministry of Foreign Affairs headquarters in Rome. Taking stock from the Lucca G7 Foreign Ministers Joint Communiqué, the meeting reaffirmed the comprehensive approach to maritime security and the fundamental value of international cooperation to fight current and future challenges. Representatives from key African countries, International Organizations and NGOs provided their proactive contributions from their specific points of view. A special focus was dedicated to the next steps of maritime security, in particular the increasing technological sophistication of potential attackers and the integration of a cyber security dimension in the maritime domain in terms of capabilities, research and technologies. The protection of the environment in the high seas and in the coastal regions, as well as the conservation and sustainable use of biodiversity were also extensively considered as crucial to mitigate future security risks in terms of populations displacement, loss of economic opportunity, domestic instability.